Days are getting more lonely, especially lately – but err, I just think of it like a vacation away from the noise of the world. But It would really be nice if someone would send me some sweets. Before, I remember having this issue in high school then my grandma sent me Ferrero Chocolates (not sure that’s how it’s spelled sorry LOL). There is something about surprise deliveries from people special to you that makes it more special. The thing is, you make the person you send things feel she is remembered. 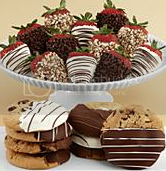 I wish someone would send me in these cookies from shari’s berries. Actually, it’s what make me thought of posting this. In movies, guys send their girls these fancy stuff. I wish I could experience that, some day. Now, forget about my drama – I’m just saying the truth! Wouldn’t you feel better after a bad day, then getting these sweets from out of nowhere? Just think of how thoughtful that is, whether if it’s for a loved one or anyone from you family!